Last season linebacker Kamerion Wimbley inked a deal worth $48.5 million over five years. One offseason later, the Raiders are on the verge of sending him packing if he and the team can’t redo that very deal that made him one of the richest LB’s in the game. Wimbley was designated as the team’s “exclusive” franchise player prior to last year’s lockout, and upon signing the new deal he received a $4.25 million signing bonus and a fully guaranteed base salary of $750,000 in 2011. Currently, $6.5 million of Wimbley’s $11 million base salary is fully guaranteed, which when combined with his 2011 compensation, is slightly higher than the franchise tender ($11.312 million). If Wimbley is on the Raiders’ roster on the fifth day of the 2012 league year (March 17), the remaining $4.5 million in base salary for 2012 becomes fully guaranteed. On the same date, Wimbley’s $11 million base salary in 2013 and $2 million of his $10 million base salary in 2014 will become fully guaranteed. In other words, there is no financial incentive for Wimbley to restructure his contract as his $6.5 million in fully guaranteed base salary in 2012 is not offset. If released, he’ll earn that money and get to be a free agent. At 6-foot-4 and 255 pounds, and with the ability to play either defensive end in a 4-3 or outside linebacker in a 3-4, Wimbley could certainly receive more than $17.5 million in guaranteed money on the free agent market this month. A 2006 first-round pick out of Florida State by the Browns, Wimbley has been a starter in 94 of his 95 games, totaling 369 tackles, 42.5 sacks, two interceptions and eight forced fumbles. 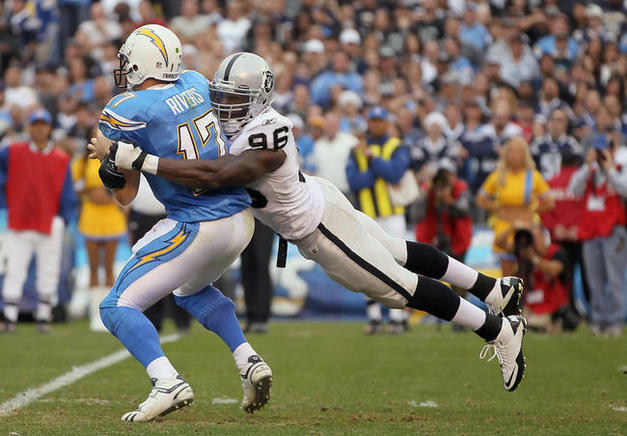 In 32 games over his two seasons with the Raiders, Wimbley has 16 sacks. Love him, and in the right scheme he can be a force in our opponents backfield, but we have no choice bu to restructure his deal. Hope it works out, especially if we go to a 3-4. Let him go! All he is good for is rushing the passer! Greedy player all about me if he is not willing to restructure for the team!